Boeing Commercial Airplanes (BCA) is a division of the Boeing Company. It designs, assembles, markets, and sells jet airliners and business jets (Boeing Business Jets); it also provides product-related maintenance and training to customers worldwide. 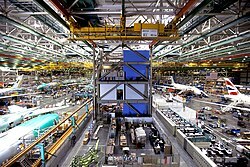 It operates from division headquarters in Renton, Washington, with more than a dozen engineering, manufacturing, and assembly facilities located throughout the U.S. and internationally. BCA includes the assets of the Douglas Aircraft division of the former McDonnell Douglas Corporation, which merged with Boeing in 1997. In late 2016, BCA was home to some 78,000 employees. Aviation Partners Boeing, a 50/50 joint venture with Aviation Partners Inc. In November 2016, Boeing announced that Ray Conner, 61, would step down immediately and be replaced. Kevin G. McAllister was named president and CEO of Boeing Commercial Airplanes (BCA). McAllister was the first outside recruitment in BCA history, and instructed by Dennis Muilenburg to triple revenue from aftermarket services from $15 billion to a target of $50 billion over 10 years, with a new purpose-built unit headed by Stan Deal. Keith Leverkuhn was the vice president and general manager of the 737 MAX program in March 2017 when it received certification. For all models sold beginning with the Boeing 707 in 1957, except the 720, Boeing's naming system for commercial airliners has taken the form of 7X7 (X representing a number). All model designations from 707 through 787 have been assigned, leaving 797 as the only 7X7 model name not assigned to a product. For model numbers in the 707 to 777 range, the model number consists of an airplane's model number, for example 707 or 747, followed by a dash and three digits that represent the series within the model, for example 707-320 or 747-400. In aviation circles, a more specific model designation is sometimes used where the last two digits of the series designator are replaced by the two digit, alpha-numeric Boeing customer code, for example 747-121, representing a 747-100 originally ordered by Pan American World Airways (Boeing customer code 21) or 737-7H4, representing a 737-700 originally ordered by Southwest Airlines (Boeing customer code H4). Codes do not change for aircraft transferred from one airline to another. Unlike other models, the 787 uses a single digit to designate the series, for example 787-8. This convention was followed in the development of the newest version of the 747, the 747-8, along with the 737 MAX and 777X series. Additional letters are sometimes appended to the model name as a suffix, including "ER" to designate an "extended range" version, such as the 777-300ER, or "LR" to designate a "long range" version, for example 777-200LR. Other suffix designators include "F" for "freighter" (747-400F), "C" for "convertible" aircraft that can be converted between a passenger and freighter configuration (727-100C) and "M" for "combi" aircraft that are configured to carry both passengers and freight at the same time (757-200M, 747-400M). Passenger aircraft that are originally manufactured as passenger aircraft and later converted to freighter configuration by Boeing carry the suffix "BCF" designating a Boeing converted freighter (747-400BCF). The table below lists only airliners from the jet era. 717 156 Twin-engine narrow-body jet. Developed by McDonnell Douglas as the MD-95 as an evolution of the DC-9 family. Airlines commonly order aircraft with special features or options, but Boeing builds certain models specifically for a particular customer. The Boeing 707-138B was a shortened-fuselage, long-range model only sold to Qantas. The Boeing 757-200M was a single-example model built for Royal Nepal Airlines (now called Nepal Airlines). This plane could be converted between passenger and freighter configuration. It was launched by Royal Nepal Airlines in 1986 and delivered two years later. The Boeing 747 Large Cargo Freighter is a wide-body cargo aircraft. The 747SP production resumed nearly four years after the supposedly final 747SP was built, to manufacture one aircraft for the United Arab Emirates. It had a cockpit crew of two instead of the three-crew layout of other 747SPs. Two Boeing VC-25s were built for the US Air Force as Presidential Air Force One transports. This model was a highly modified 747-200B. Boeing was a consultant to Sukhoi on the Russian Regional Jet program that subsequently became the Sukhoi Superjet 100 twin-engine narrowbody airliner. Boeing 2707 – supersonic airliner, canceled. Boeing 7J7 – high-efficiency propfan airliner, canceled and may later resume for Y1. Boeing 747-300 Trijet - high-efficiency trijet version of the Boeing 747-200, canceled. Boeing New Large Airplane – double-deck jumbo airliner, canceled. Boeing RC-1 - cargo aircraft, canceled. Boeing Sonic Cruiser – near-sonic airliner, canceled. Boeing Liquid Hydrogen (LH2) airplane that uses liquid hydrogen as fuel. Hypersonic Airliner Concept. Mach number 5 speed. Boeing 117 - used on XPBB, B-29 and derivatives (307, 367, 377), all Aero Spacelines models, Tupolev Tu-4, Tu-70, Tu-75, Tu-80. ^ "Boeing: The Boeing Company: General Information". www.boeing.com. Retrieved March 11, 2019. ^ a b "Backgrounder" (PDF). The Boeing Company. November 2014. Boeing Commercial Airplanes employs more than 83,000 people under the leadership of President and CEO Ray Conner. The business unit’s revenue in 2013 was a record $53 billion. ^ "Boeing Commercial Airplanes: A Better Way To Fly". The Boeing Company. ^ "McDonnell Douglas shareholders approve merger with Boeing" (Press release). The Boeing Company. July 25, 1997. Archived from the original on January 20, 2011. Retrieved January 19, 2011. McDonnell Douglas Corporation's (NYSE: MD) shareholders voted today to approve the merger with The Boeing Company (NYSE: BA). ^ a b c "Boeing goes outside for new Commercial Airplanes CEO". seattletimes.com. November 21, 2016. Retrieved January 1, 2017. ^ "Boeing Vancouver - Global IT Solutions for Airline Operations". www.aeroinfo.com. Retrieved March 11, 2019. ^ "Aviall - Aircraft Parts, Supplies, Chemicals, Tools and Repair Services - Aviall". www.aviall.com. Retrieved March 11, 2019. ^ "Home - Aviation Partners Boeing". www.aviationpartnersboeing.com. Retrieved March 11, 2019. ^ "Aerospace Engineering Services". CDG. Retrieved March 11, 2019. ^ "Boeing Acquires Alenia North America's Interest in Global Aeronautica". Boeing, December 22, 2009. ^ "Executive Biography of Kevin McAllister". Boeing.com. Retrieved January 1, 2017. ^ "Boeing 737 MAX 8 Earns FAA Certification". boeing.mediaroom.com. PRNewswire: Boeing Communications. March 9, 2017. ^ "The Boeing 737 Technical Site". B737.org.uk. Retrieved March 31, 2013. ^ The Boeing 767 family. Boeing. ^ "Boeing: 777". www.boeing.com. Retrieved June 5, 2018. ^ 787-8 Fact Sheet, 787-9 Fact Sheet. Boeing. ^ Trimble, Stephen. "Boeing shows off completed horizontal stabiliser for 787-9". Flight International, January 15, 2013. ^ "Boeing Business Jets". Boeing. Retrieved November 7, 2013. ^ "Boeing: Commercial". www.boeing.com. Retrieved March 11, 2019. ^ "Boeing: Commercial". www.boeing.com. Retrieved February 19, 2019. ^ Gervais, Edward L. (November 29, 2007). "Boeing Current and Future Product Review" (PDF). Presentation to Federal Aviation Administration Great Lakes Region 23rd Annual Airport Conference. Boeing Commercial Airplanes. p. 54. Archived from the original (PDF) on March 19, 2008. Retrieved March 18, 2008. ^ Pappalardo, Joe (June 26, 2018). "How Boeing's Hypersonic Passenger Plane Concept Works". Popular Mechanics. Retrieved March 11, 2019.